I had some leftover chicken stuffing after I made the chicken stuffed parathas. I wanted to use it up. I initially planned to just make a sandwich. I then changed my mind and wanted to make puffs. I had puff pastry readily available. Instead of folding it up into a rectangle or a triangle I decided to shape it up into rose rolls. 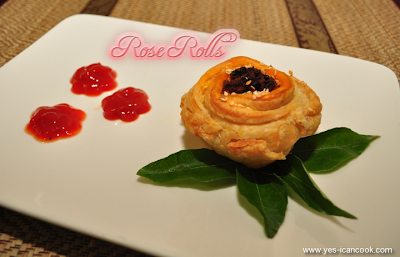 I have made rose rolls before but with basic bun dough. I was not blogging then so it never made it to this blog. I had just about 3 Tablespoons of the chicken stuffing and I made 2 rose rolls with it to serve at tea time. Oh they were so delicious warm out of the oven. You can make these rose rolls with any stuffing of choice. Olive oil or Egg wash as needed. I used olive oil. You can prepare egg wash by slightly beating an egg and adding 1 Tablespoon of water to it. 2. Take one puff pastry square from the refrigerator. 3. You can use it as is or you can dust some all purpose flour and roll it a bit. 4. Brush some melted butter on the puff pastry. This is optional. 5. Place 1 1/2 Tablespoon of the stuffing in the center of the puff pastry square. 6. Using a sharp knife make slits from the four edges till they reach the stuffing. 7. Take one of the sides (between 2 slits) and cover it over the stuffing. 8. Take the next side and cover it over the stuffing and the first side of the puff pastry. Use a little bit water to make the edges wet so that it sticks to the first side. 9. Repeat this with the next two side too. Make sure you wet the edge and pinch it to the previous side or else it will open up when it bakes. 10. Using your fingers open the layers just at the top a bit. You can even form curves. 11. Brush with egg wash or with olive oil. 12. Sprinkle with sesame seeds. This is optional. 13. Repeat with the other puff pastry. Place in a slightly greased baking tray or a tray lined with parchment paper. 14. Bake in the oven for 15-20 minutes or till golden and done. 15. Remove from oven and let it cool down just for 2 minutes. Very nice! Will try this on veg version! Very tempting recipe! 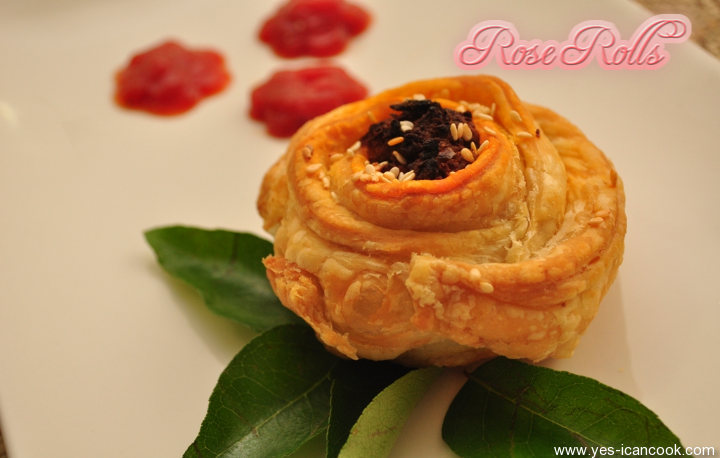 Love the idea of making the rose shape rolls. Such a nice recipe looks so beautiful. I am sure it taste great too.